This is an Angel that sits in our garden that my wife and son picked out a couple of years ago. So was wondering what photo to take and spotted her in the back garden. 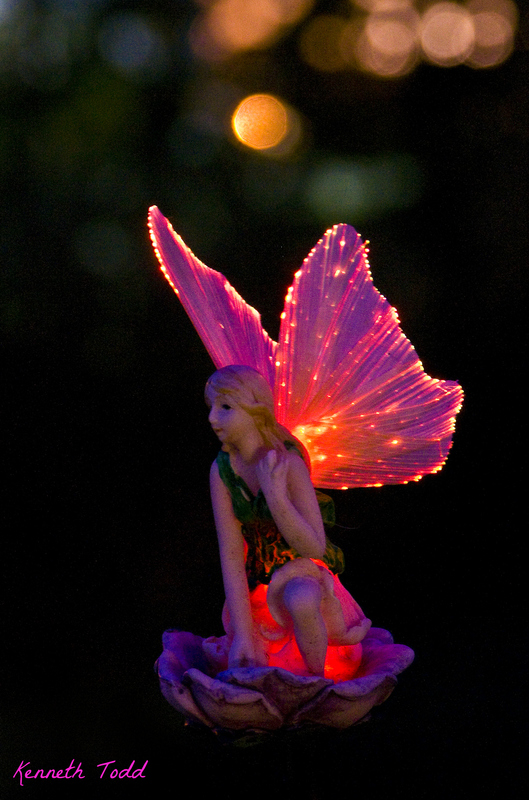 It is a solar powered Angel with fiber optics that change color every few seconds. So depending when you hit the shutter the combinations of colors in her wings will end up so different. I never thought her face and body would be lit up as all the light comes from the wings that are behind here of course. However, with a 3 second shutter and 1600 ISO it came out OK. There is quite a bit of noise in the photo but not bad I guess and I like the Bokeh effect of the buildings off in the distance. Some of you may have seen this quote on my Facebook page earlier today, but I will repeat it here as I love it. And another that speaks to the same topic. So before you go trying to change the world, start with yourself. Love it! Awwww … what a beautiful capture! Tks Gina. Your Angels inspired me. Thank you….. Excellent.. and words timely for me.. Thanks Kenneth..